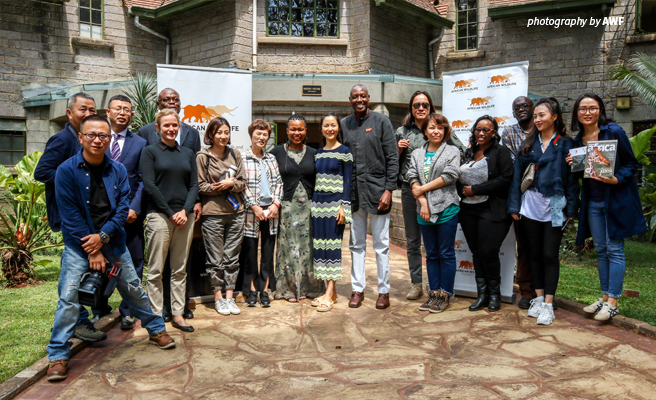 The African Wildlife Foundation (AWF) on September 10, 2018 hosted Chinese actress Jiang Yiyan and her crew at its Nairobi headquarters. Ms. Yiyan is on a week-long trip to research and prepare for her next movie which will be wildlife and conservation themed. While in Kenya, Ms Yiyan will visit the Amboseli National Park where she will interact with AWF staff who will share with her the challenges and successes involved in wildlife conservation on the continent. The visit comes a few days after AWF launched the Save African Endangered Species exhibition at the Beijing Zoo in China. The exhibition will run for two months and is expected to raise awareness of the plight of Africa’s wildlife in the continent’s largest trade and infrastructure partner. AWF and partner WildAid have in the recent past run a public awareness campaign in China on the damaging effects of ivory and rhino horn demand. In billboards and through television public service announcements, Chinese celebrities — such as former NBA star Yao Ming, actress Li Bingbing, and classical pianist Lang Lang — urge audiences not to buy ivory. AWF also maintains an online presence in China. China’s active online audience can visit AWF's Chinese-language website and reach out to AWF via some of China’s most popular social media platforms. These include Sina Weibo, WeChat (Weixin), YouKu and Tencent Video.